You would think the land of Aristotle, Euclid and Pythagoras could master double entry bookkeeping, but the unfolding calamity in Greece suggests otherwise. $11 billion in Greek bonds come due on May 19th and that is more than the government has on hand. 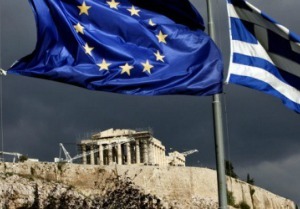 Greece, it turns out, has let its welfare and entitlement spending run amok and now finds itself woefully out of compliance with the European Union’s (EU) rules on budget deficits. The EU’s annual deficit standard for its 16 member states is 3% or less. In 2009 Greece had projected a deficit of 3.7% but the final number was an Olympian 13.6% – citing accounting irregularities for the surprise. The news set off alarm bells at the EU and in world markets as well. By the end of April, Greece had accepted a $143 billion bailout package arranged by the EU and the International Monetary Fund (IMF), but the accompanying austerity measures, which included tax increases, pension reductions and public and private sector wage cuts, triggered strikes and riots as workers and retirees protested through the streets of Athens. Not to be outdone, world stock and bond markets threw a tantrum of their own and by May 10th the bailout had ballooned to an eye-popping $950 billion. Greeks, as the world is finding out, enjoy one of the lowest retirement ages at 60, and one of the sweetest social safety nets in the EU, with all sorts of special provisions for occupations with cozy political ties. It has become painfully obvious in the last six months that Greece’s entitlement promises far outstrip the government’s ability to pay them. What Greece needs, but alas is not forth coming, is a new and improved Grecian formula that can turn gray haired retirees into virile hardworking taxpayers. So – Why all the fuss? $11 billion is a rounding error to the trillion dollar losses investors have taken the past two years. Why should a glitch in Greece traumatize global markets? After all, Greece’s GDP, at $340 billion, represents only 2% of the euro-zone’s $16.4 trillion GDP. What haunts markets is the eerie similarity between Greece and the collapse and distressed sale of Bear Stearns in March 2008. Bear turned out to be the lead domino in what became a long line of prominent bank failures and massive rescues of “too big to fail” financial institutions. In just the past month Greece’s sovereign debt was downgraded to junk while Portugal and Spain suffered lesser downgrades. Also on “negative watch” with ratings agencies are Italy and Ireland. Rightly or wrongly, investors have concluded that the frightening run on the world’s biggest banks may be coming back to life as an equally scary run on the world’s sovereign debt. Is that a fair comparison? On one side of the financial crisis was a housing bubble that burst – that bust was transmitted to bank balance sheets via inextricably related mortgage debt that went toxic as house prices fell, melting down bank balance sheets in the process. The sovereign debt of Greece, Spain, Portugal and other developed countries has an inextricable link as well – entitlement promises made to citizens and especially to retirees. It is the Euro currency, around since only 1999, that makes this a global problem. In past eras, Greece would have paid off profligate promises with dramatically devalued drachmas, but shackled to the Euro currency, that option is off the table. The big fat Greek message may simply be – the modern social, welfare state has reached a tipping point where promises made (and thought to be guaranteed) exceed governments’ ability to fulfill them. On this side of the Atlantic, the obvious comparison is our 50 states, which, like Greece, have made plenty of entitlement promises but have no access to printing presses. If they aren’t watching Greece intently, they should be. There have been warnings. In just the past six months a number of scholarly papers have expressed growing concerns over the funding of earned entitlements at the state level, the biggest of which is public employee pension funds. In February the Pew Center on the States published “The Trillion Dollar Gap”, a 60 page study which concluded that the Public Employees Pension plans of all 50 states were underfunded by an aggregate $1 trillion. Professor Novy-Marx of the University of Chicago and Professor Rauh of Northwestern, using a more conservative methodology calculated a gap of $3.2 trillion. An American Enterprise Institute paper by Andrew Biggs also calculated the pension underfunding at over $3 trillion. And finally last month the Manhattan Institute for Policy Research published, “Underfunded Teacher Pension Plans: Its Worse Than You Think”- a title that speaks for itself. To put the unfunded promises of $3 trillion in context, that is three times the $1 trillion in municipal bond debt owed by the 50 states. Additional context for the entitlement challenges the advanced countries face is found in the nature of the economic recovery now underway. Across the globe emerging markets like India, China and Brazil are enjoying a much more robust recovery than that in Europe, Japan and the U.S. The better performance of the developing economies is in a large part a consequence of their healthier balance sheets. According to the IMF, government debt as a percent of GDP is 98% in advanced countries and only 39% in developing counties. This recent cycle of boom, bust and now recovery runs contrary to the old axiom that, “if the advancedeconomies catch a cold the developing economies catch pneumonia.” The economic data suggests that old paradigm has been turned upside down. It is fair to conclude that big government obligations, whether explicit (debt) or implicit (entitlements), are burdening economic growth potential and that burden is only getting bigger. The Greeks have faced tight spots and long odds before, most famously in 480 B.C. at the pass of Thermopylae, where a band of 7,000 mostly Spartans held off the entire Persian army for 7 days before finally being overrun. Like it or not the Spartan heritage of discipline and austerity may be the next Greek revival to sweep the “enlightened” world. Ashby M. Foote III is president of Vector Money Management in Jackson, MS. Contact him at ashby@vectormm.com.